Used paper coffee cups usually end up in rubbish bins. Inspired by World Environment Day, Business and Arts South Africa (BASA) Artworks Mentor of the Year 2009, Yvette Nowell, from RMB, partnered with visual artists Hannelie Coetzee and Usha Seejarim of Such Initiative last year to create a ‘swarm of bees’– from 400 recycled, disposable paper cups in the atrium outside the Daily Buzz coffee shop at 3 Merchant Place, Sandton. The eco-conscious temporary artwork was inspired by World Environment Day and spoke to four elements pertinent to RMB’s sustainability and environmental risk reporting: Water, Waste, Travel and Energy. 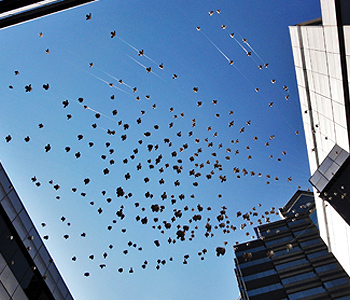 The swarm artwork played on the role of the collective, particularly in the corporate environment, where working together – individually, but not in isolation – is crucial. The swarm installation was constructed in just four days, but only lasted a week, when a capricious Johannesburg winter storm gave it a battering and brought it to the ground. Although the artwork was always going to be temporary – Mother Nature somehow had the final say, forcing the 'swarm of bees' to be recycled again.